Last week, we successfully hosted in Brussels the 4th and last Regional Workshop for our Erasmus+ project “Q-Europe: Trends and challenging influencing quality in long-term care”. During the 4 days of the workshop, the representatives of the four partner organisations had the opportunity to learn more on current trends and challenges influencing quality in LTC and to work on a new handbook for staff working in the field. The first day of our workshop began with a meeting to plan the next working steps on the final version of the “Q-Handbook”, which will represent the main outcome of this Erasmus+ project. Then the participants had the opportunity to meet Ms Diana Eriksonaite, Policy Officer from the Unit on Modernisation of Social Protection Systems of the European Commission Directorate General on Employment and Social Affairs. Ms Eriksonaite gave a presentation on sustainability and inequality challenges and opportunities for quality measurement in social services, long-term care and pension systems in Europe. The second day of the workshop started with a lecture by Marieke Kroezen, Project Manager from Erasmus MC at the University Medical Centre of Rotterdam, who also held a workshop on trends and challenges for quality in long-term care. The participants had the opportunity to visit the European Parliament and learn more about its work, as well as to meet Alejandro Molledo from the European Disability Forum, which also acts as the secretariat of the Disability Intergroup of the European Parliament. 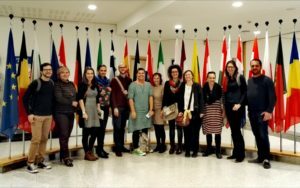 The participants talked about advocating for persons with disability, web accessibility, and the work of the Disability Intergroup. The third day included a study visit to the “Woonzorgcentrum De Weister”, a small-scale facility for elderly people in Kortrijk – where the participants could learn more about their innovative multi-level approach based on everyday activities and “lifestyle differentiations” – and a visit to the De Lork facility in Brussels, getting to know more about they work with people with mental disabilities through housing projects and apartment groups. Besides Eurodiaconia, the Erasmus+ project “Q-Europe” consortium is set up by our members Slezska Diakonie (lead partner, Czech Republic) and Diaconia Valdese (Italy), as well as the University of Trnava (Slovakia).